Fusilli Col Buco With Toasted Breadcrumbs, Garlic, and Basil Olive Oil is a twist on spaghetti aglio e olio, a traditional Sicilian pasta dish featuring garlic, olive oil, and red chilies. But this classic St. Joseph’s Day (San Giuseppe) pasta dish goes several steps further. We take fresh breadcrumbs and brown them in garlic, olive oil, red pepper, and anchovy fillets. Don’t be afraid of the anchovies, they bring a complexity to the fusilli dish without tasting fishy. Italians world-wide celebrate St. Joseph’s Day, the patron saint of fathers, on March 19th. Come celebrate with us. This dish is easy and delicious. For this recipe you’ll need: olive oil, red pepper flakes, oil-packed anchovy fillets, coarse fresh breadcrumbs, garlic, kosher salt, flat-leaf parsley, pasta. St. Joseph’s Day, March 19th is, in Italy, also Father’s Day which isn’t at all surprising since he was the foster father of Jesus. This day is a big feast for Italians especially the Sicilians. Legends in the middle ages attribute the end of a devastating drought to a prayer-devotion that the Sicilian people made to St. Joseph. This feast is a celebration and thank you to San Giuseppe. Different Italian regions celebrate this day differently, but they all involve special meatless foods. Traditional etiquette is that no-one can be turned away from the table. Many foods have been added and deleted in the many years but tow constants remain: no meat and breads in symbolic shapes. Pasta with breadcrumbs (we chose Fusilli col buco (hole)) symbolize the sawdust that covered St. Joseph’s floor. Sfinge di San Giuseppe is a deep fried treat like a filled cream puff. Fava beans, which are considered “lucky” because during the drought, the Fava thrived while other crops failed. Pasta with breadcrumbs was and is still very popular. The addition of toasted breadcrumbs were in place of cheese since cheese was a luxury. Truly a cucina povera dish. Breadcrumbs on pasta are known as the poor man’s cheese. 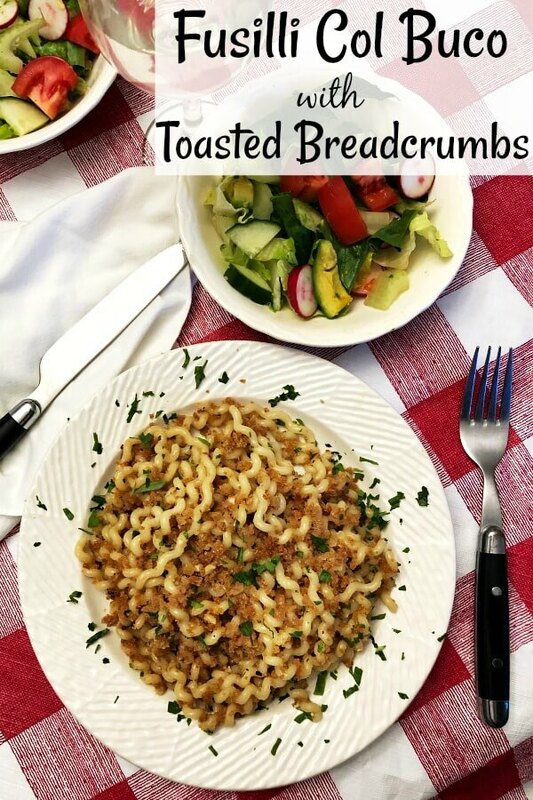 The toasted crumbs bring a nice crunch to the fusilli pasta. Our Fusilli with toasted breadcrumbs may be a poor man’s dish but it is rich with flavor. 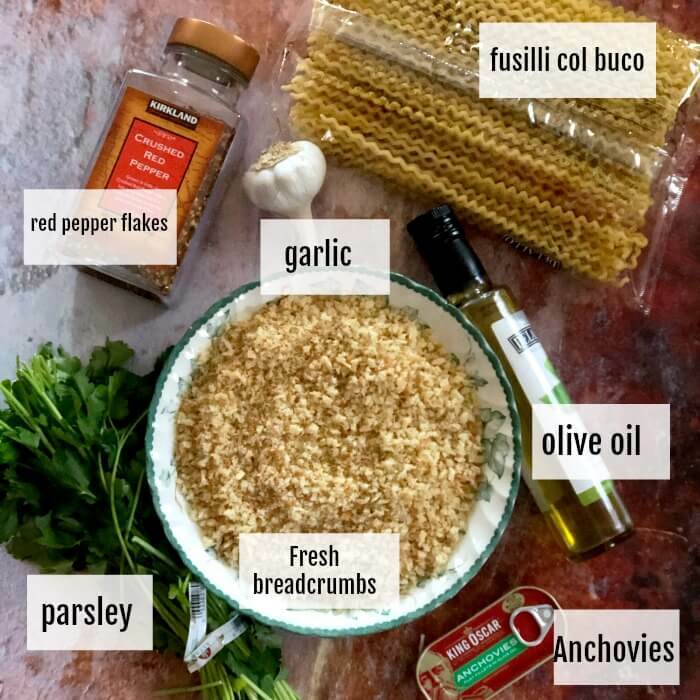 Simple ingredients for the Fusilli with Toasted Breadcrumbs served for St. Joseph’s Day Feast. You can make this dish with any kind of long pasta. Very popular is the malfaldine which are a little like lasagna only thinner. You can see what they look like at Memoire di Angelina. We like the curlicue fusilli pasta with the hole in the middle. This pasta comes from southern Italy. Originally the Neapolitan housewives would take a fresh bucatino and curl it around a slender knitting needle. Very labor intensive, right? The fusilli pasta holds a tomato sauce or an olive based sauce well. 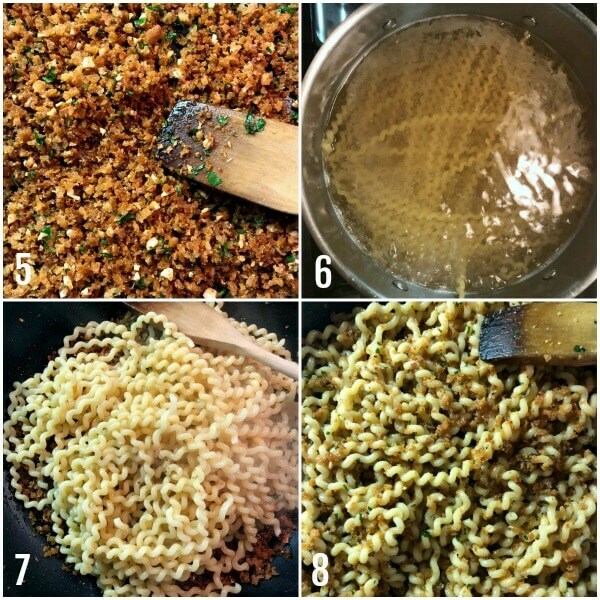 In fact, the recipe for the fusilli with toasted breadcrumbs is a lot like the famous Spaghetti Aglio e Olio. 1. 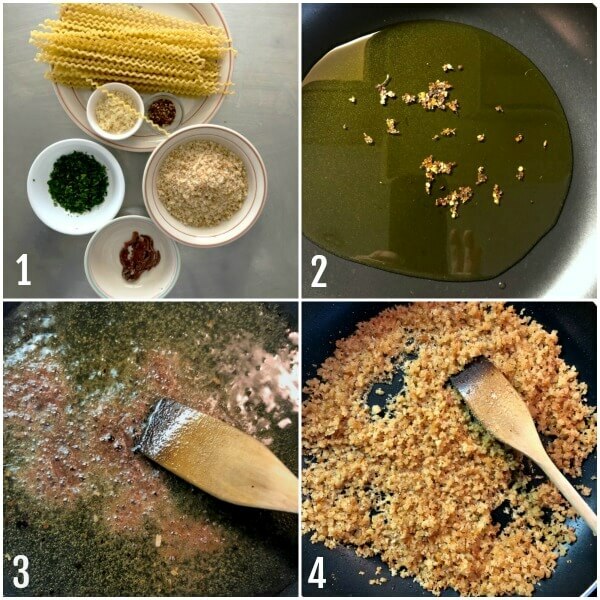 Prepare the simple ingredients for Pasta with breadcrumbs. 2. Sauté the red pepper flakes in olive oil. 3. Add the anchovies to the oil. 4. Toss the fresh breadcrumbs in the oil. Spaghetti aglio e olio sometimes is served with Pecorino or Parmesan but that isn’t traditional. Fusilli con la mollica recipe has anchovies. Rotini have a tighter helix with a smaller pitch compared to Fusilli. How long should you cook fusilli pasta? Fusilli pasta twists from 10-12 minutes and the Fusilli Bucatini for 11- 14 minutes. It’s always good to test for the doneness you want. You may even check it earlier. 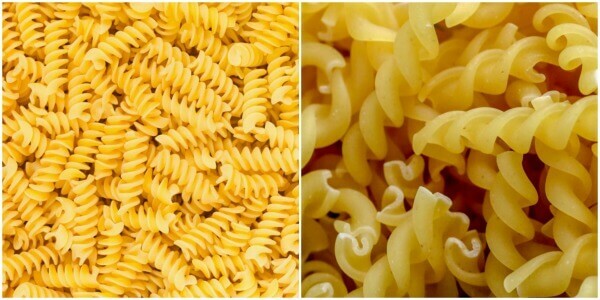 What is the difference between rotini and fusilli? Rotini is a type of corkscrew-shaped pasta that is related to fusilli but has a tighter helix with a smaller pitch. How do you know when pasta is al dente? “Al dente” means to the tooth. Chewy and firm, hold its whole shape in whatever sauce you put it in. So if you are going to toss the pasta with sauce or olive oil that means the sauce in the pan cooks the pasta a second time. The solution? Cook the pasta molto al dente. How do I cook the pasta molto al dente? It is about 3 minutes from being the chewy al dente. There should be a chalky, gritty quality to the middle of the pasta. If you look at the cross section of the noodle, where you bit, you’ll see a thin white ring in the middle. When you transfer the pasta with some of the pasta water to the pan, the pasta will continue to cook. 5. Add the parsley and garlic to the breadcrumbs. 6. Drop the fusilli into boiling salted water. 7. Drain the pasta and add to the breadcrumbs. 8. Toss the fusilli with the breadcrumbs. This dish has many names: Sawdust Pasta, Carpenter’s Pasta, Pasta with Breadcrumbs, Pasta con la mollica, St. Joseph’s pasta as well as pasta di san Giuseppe. The name really doesn’t matter. It’s delicious whatever you call it. There are few ingredients in the fusilli dish and it takes very little time. We like to toast the breadcrumbs ahead of time so when we finish the pasta we put it all together and it’s ready to serve. The parsley is optional but it adds color and flavor. You don’t like anchovies? You may omit them but they really give that dish that extra pizzazz. Once you add the anchovies to the oil they virtually melt before your eyes. 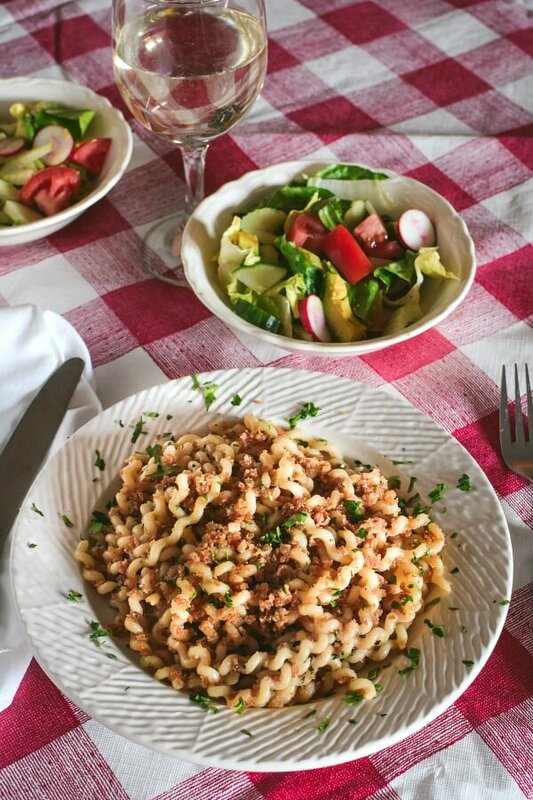 Fusilli Pasta with Toasted Breadcrumbs Celebrating St. Joseph’s Day – Italy’s Father’s Day. Be sure to save 1/2 cup of the pasta water before getting rid of it. It’s really a good habit to get into even if the recipe doesn’t call for it. If the sauce or pasta seems too dry add that little bit of water and it’s unbelievable how it can improve and extend the sauce. Make your St. Joseph’s Day special by making and enjoying Fusilli with Toasted Breadcrumbs. It’s one of those dishes you’ll want to make for your family more often than just March 19th. We show you two ways how to make Fusilli Pasta with Toasted Breadcrumbs, the ingredients are the same. We’re making it again for Italian Father’s Day, Honey specifically asked for it. These pastas are light and meatless! The following are affiliate links. We are a participant in the Amazon Services LLC Associates Program, an affiliate advertising program designed to provide a means for us to earn fees by linking to Amazon/com and affiliated sites. This is the fusilli col buco pasta that we use. It’s actually a combination of bucatini with boing boing curls. The pasta really grabs the sauce and breadcrumbs and hangs on to them. We enjoy using the pasta with light sauces and also tomato based. Have you tried it? If so, let us know how you like it. This is a variation on spaghetti aglio e olio, a classic Italian pasta dish featuring olive oil, garlic, and hot peppers. This recipe adds fresh breadcrumbs toasted with olive oil, garlic, hot pepper flakes, and anchovies. Although the anchovies are optional, they bring a depth to the dish you wouldn’t find otherwise. The anchovies does not make the pasta taste fishy at all. Don’t try to shortcut by purchasing the fine breadcrumbs you find in the store, they’ll be soggy in the final dish. These breadcrumbs stay crunchy! This recipe is so easy you’re going to immediately wonder why you don’t make this more often. If you like this recipe, please consider giving it a five-star rating. This helps others to decide whether to try the recipe. A variation of Spaghetti Aglio e Olio a classic Italian pasta dish with garlic, olive oil, and hot peppers. This recipe includes fresh breadcrumbs that are toasted in a spicy oil with garlic. The optional anchovies add a briny taste that's not fishy. Fresh parsley adds flavor and color. This dish is typically served on St. Joseph's Day. Bring a large pot of well-salted water to boil over high heat. Heat the olive oil and red papper flakes in a 12-inch skillet over medium-low heat, stirring occasionally with a wooden spoon, until the pepper flakes are sizzling, about 5 minutes. Add anchovies, if using, and mash thm with the spatula until they start to dissolve. Raise the heat to medium, add the breadcrumbs, and cook, stirring often, until the crumbs are deep golden, about 3 minutes. Add the garlic and cook, stirring, until the breadcrumbs are crisp and brown, about 1 minute. 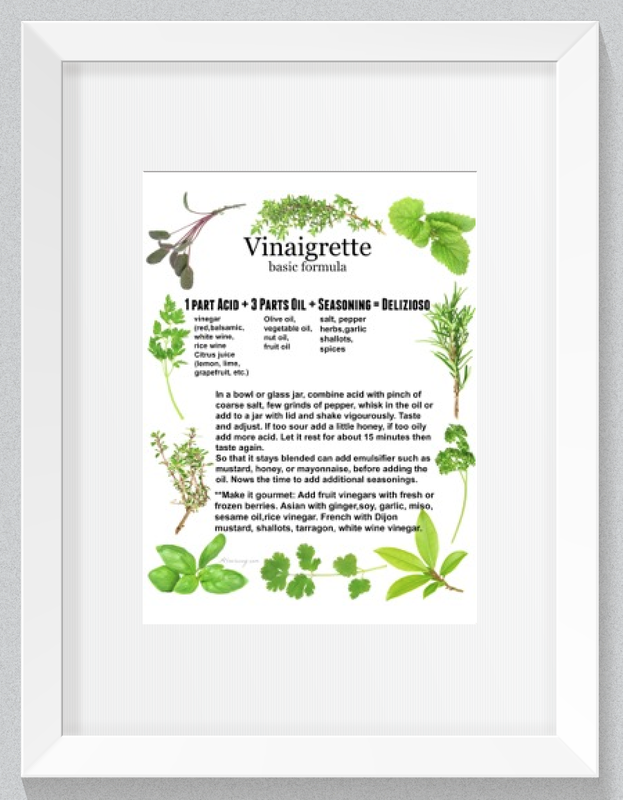 Remove from heat, stir in the parsley, and season with salt to taste. (If using anchovies, you may not need extra salt). We did. Cook the pasta in the boiling water according to package directions until al dente. (In this recipe you don't have a lot of sauce so you DO want it al dente and NOT molto al dente). Immediately return the pata to the pot over medium-low heat, add half the breadcrumb mixture and toss to combine. If necessary, add some of the reserved cooking water to moisten. Season with salt. Serve sprinkled with the remaining breadcrumbs. Meanwhile in a large skillet, sautè the garlic, red pepper flakes, and anchovies in 1/2 cup olive oil over medium-low heat, until the garlic barley starts to to turn golden. In another skillet, sautè the breadcrumbs in 2 Tablespoons of olive oil over low heat until the breadcrumbs are lightly toasted. Be careful, once they start to toast, they cook quickly and can burn. Turn off heat and season with a little salt. Cook the pasta in the boiling water according to package directions until al dente. Drain and transfer the pasta to the pan with the garlic anchovy olive oil. Mix the pasta in the olive oil over low heat. When the pasta is seaoned with the olive oil and most of the water clinging to the pasta has evaporated, sprinkle half of the toasted breadcrumbs and mix well. Serve immediately and top with the remaining breadcrumbs. Inspired by Fine Cooking's Spaghetti With Fresh Breadcrumbs. Note: Recipes and content from ©2014-2019 All Our Way are copyright protected. Please do not use content or recipe without prior written permission. If you want to share the information, please link to this post. Grazie. 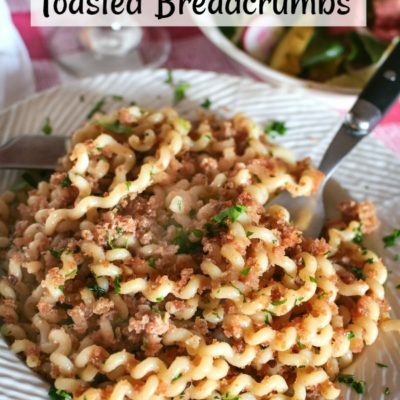 Pasta with breadcrumbs is one of my favorite pasta dishes! I really love all of the St. Joseph’s Day dishes, too, especially the sfinge. My grandmother also made a savory sfinge variation with anchovies in it that my grandfather loved! I think I will make a big bowl of this delicious Fusilli this weekend. Such simple, beautiful flavors! We took an Italian cooking class once that made me a believer in using anchovies in pasta dishes. It adds so much saltiness and flavor without being fishy, so I’m definitely giving this pasta dish a try! All about the breadcrumbs! I thought you had me at breadcrumbs, but when I saw anchovies, I was like, HELL YES. Anchovies add such a fabulous saltiness to pasta dishes like this. (And those King Oscar anchovies are the absolute BEST). I’ve never seen these particular noodles before and I’m very excited about them. They look so good and like they’d coat nicely. My mouth is watering. All things I love in a dish. Flavor from the anchovies and garlic. Texture from the breadcrumbs. Not too time consuming to make. Going into this weeks rotation for sure. I honestly think that the best pasta recipes always have the most simple ingredients. It allows all the complexity of the olive oil and the herbs to shine. I think that the anchovy fillets sound wonderful in this as well. Great recipe, Marisa! Wow, I definitely don’t have enough fusilli pasta in my life! I’ve never had it and what a shame!! This dish looks amazing. All of those Italian flavors sound incredible! What a fun pasta shape. I think the simpler the better when it comes to pasta and this may be a poor man’s dish but we would enjoy it any time. I don’t put anchovies on my pizza like my dad did but it’s amazing what they do to a dish and how they just “disappear” when you use them leaving their lovely deep flavor behind. I’m saving this one and can’t wait to try it! I know that this is going to sound strange, but I LOVE the taste of anchovies. I’m always looking for recipes to put them in, so you just made my day with this delicious fusili. And those breadcrumbs on top look to die for. I can’t wait to make this! I have only cooked that fun pasta once. Now I want to head to the store and pick some up. Putting it on my grocery list right now. This would be a fun and delicious dinner to feed a crowd (like when ALL the kids come over for dinner). I really love recipes that have a history behind them like your Fusilli Con Buco. It adds meaning and context to what would normally be just a tasty pasta recipe. Those toasted breadcrumbs with the anchovies sound like they would add a salty, umami that would really amp up the flavor of the fusili. Love that bit of heat from the crushed red pepper too. So you say noone can be turned away from the table? I’m on my way! Pasta can never be boring! That is one amazing mouthwatering pasta dish. Anything toasted with breadcrumbs is nothing but delicious! Truly comforting! Everything you make, makes me drool! I love Italian food but know so little about it. Every time I come to your site I realize that I need to try more authentic recipes! Pasta with breadcrumbs? Oh my I have to give this a try. It looks and sounds super delicious. And it’s easy to make. Perfect family dinner during weekdays. I’m saving this! A big feast indeed, St. Joseph’s day! I was lucky to be in Rome with my dad and celebrate with them. I love this pasta, a sophisticated version of aglio e olio, very tasty and filling. Great tips, too! Oh my goodness, this sounds delicious! I love that you included anchovies – I cook with them frequently, and even self-proclaimed fish haters never realize they are in there. I agree that they add so much richness without an overly fishy flavor. This looks amazing! Such a comforting and filling dish that the whole family would love! Thanks for sharing it! This looks like the ultimate comfort food dish, so full of flavor! Love the texture you get from the breadcrumbs too! Look forward to trying it soon! I love anchovies, so I won’t be skipping them. I’ve never had this dish but I have had pasta aglio e olio and I love it! 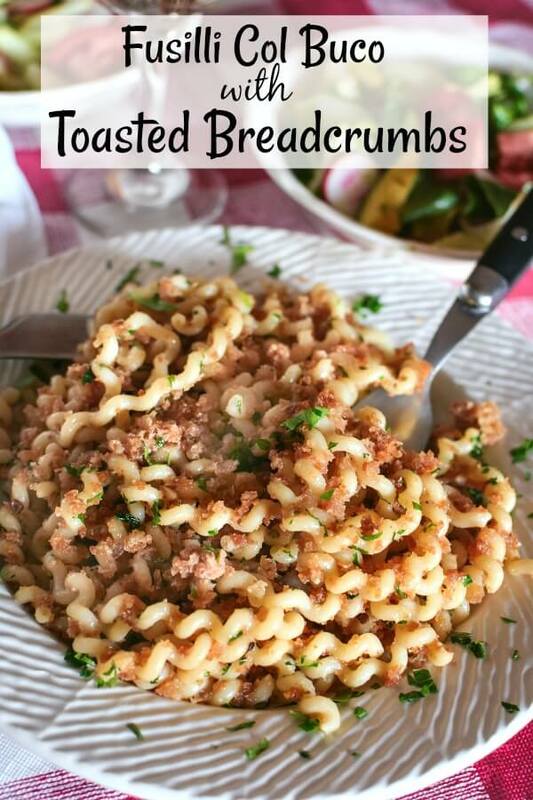 I think the addition of the breadcrumbs would bring the pasta to a whole new level! We would love this and my husband would love the anchovies! We will definitely be including them! Amazing and best dish for my family. They too enjoy it. Cant wait to try it out. We love aglio e olio and I love this delicious twist on that! It’s so simple but the simple ones are always the best recipes, right?? PS: My brother’s name is Joseph and his birthday is on March 20…it all just made sense to me now lol. What a fun shape for pasta. This sounds just like what I need…and a glass of wine. Spring has sprung…yet it is still cold!! I think I know what we are having for dinner tonight!! Grande MarisaGrazie molte nel nome di tutti gli italiani,,tu ci fai onore. Mi piacerebbe sapere della tua vita.Grazie di nuovo dalla lontana isola del British Columbia.Con affetto e ammirazione,Gian carlo. Grazie, GianCarlo! Sei molto gentile. Buon Weekend!